CBNERR staff participate in field monitoring of submerged aquatic vegetation and emergent wetlands within Reserve boundaries. Initiated in 2004, fixed transects located within SAV beds at Goodwin Islands and Gloucester Point are monitored in order to quantify SAV inter-annual variability in shoot density and distribution and identify any relationship to water quality. 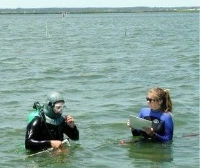 SAV transect monitoring occurs on a monthly basis, typically from April through October. Fixed transects within emergent wetland vegetation have been established at each of the Reserve components in order to measure plant diversity over time and a function of salinity regime.